The Trimble Connect extension for SketchUp provides direct access to projects, models, and other features of the Trimble Connect platform. Create a model in SketchUp and then Publish to a Project and share with team members. Import a model into SketchUp to use as a reference model. Pull in changes from collaborators as needed. Make changes and re-publish your model. Your use of the Trimble Connect extension for SketchUp is subject to the Trimble Extension End User License Agreement. To learn more about using Trimble Connect, visit the Getting Started page. 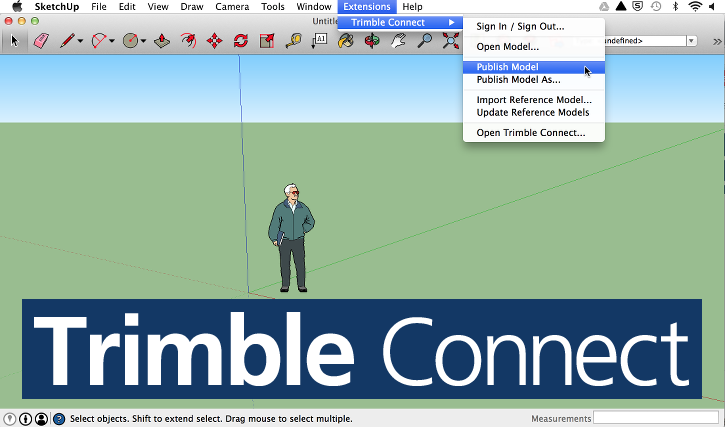 If you're using using SketchUp for Web you have a Trimble Connect login, the free version of SketchUp for Web includes the Trimble Connect Personal, if you've subscribed to SketchUp for Web - Shop then your subscription includes Trimble Connect Business. Once installed, the Trimble Connect Extension will be located under the Extensions menu. The Trimble Connect Extension comes with SketchUp 2016 by default and is located under the File menu. Sign In / Sign Out…: Sign in or out of Trimble Connect. At this time, you must to sign into a Google Account to use the Trimble Connect extension inside SketchUp. Although you need a Google Account, you don't need to create a new Gmail address. To create a Google Account and associate with any email address, visit http://accounts.google.com/newaccount and then click I prefer to use my current email address. Open Model… - Open a Sketchup file hosted on Connect. Publish Model - Upload a SketchUp model to a Connect Project. Publish Model As… - Upload a model to a specific folder or upload model with a new name. Import a Reference Model… - Imports a model file (skp, ifc, dwg, dxf) to use as a reference. The geometry in a reference file can be leveraged to coordinate modeling tasks. A layer will be created for each reference model to help you manage visibility. Reference Models are positioned based on the origin of the file. They are also locked. To re-position a reference model, use the “Position Reference Model…” feature on the context menu. Update Reference Models - Updates all reference models with the latest versions available from Connect. To upload a single reference model, use the Update Reference Model feature on the context menu (right click on any reference model). 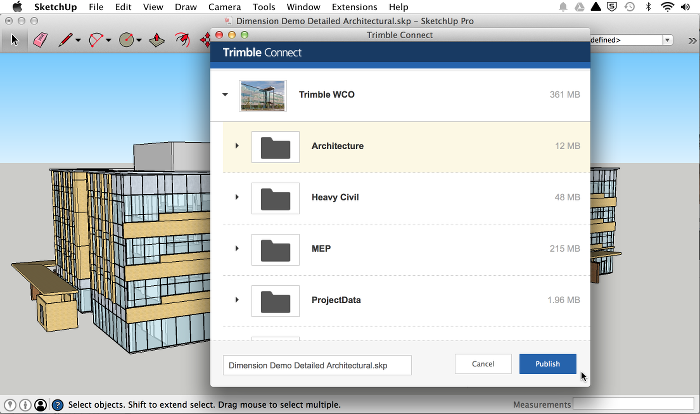 Open Trimble Connect... - Opens the full Trimble Connect web app inside SketchUp. 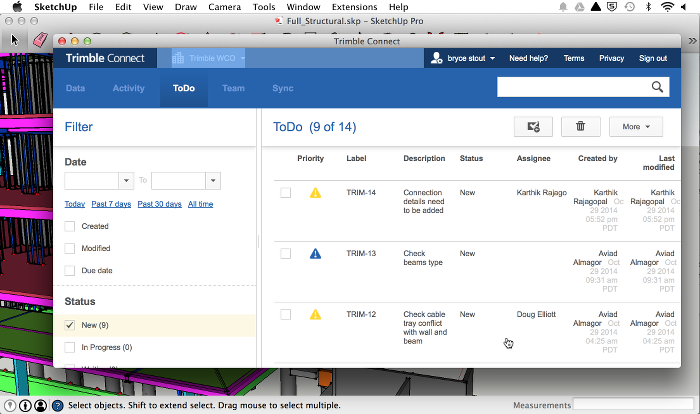 This allows you to manage your projects folders, add todos and configure Trimble Connect. If you run into any issues when using Trimble Connect within SketchUp please contact SketchUp Support directly through our contact page.